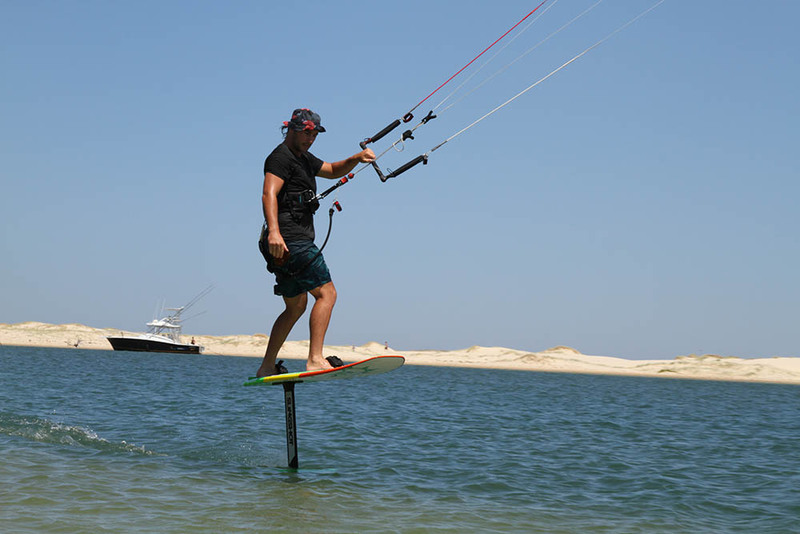 Slingshot has released a safer foil system to shorten the learning curve with their on line Foil-Academy.com and their range of multiple length mast and boards with a variety of foils. My biggest regret is that I didn’t start kiting earlier. Only a year ago, I took my first kitesurfing lesson and was bitten bad by the kitesurfing bug. At my local on the Gold Coast, many of the crew were foiling when I was stuck on the beach trying to get started on my twin tip. I looked on in awe at these guys ripping it down the Broadwater in such light winds. 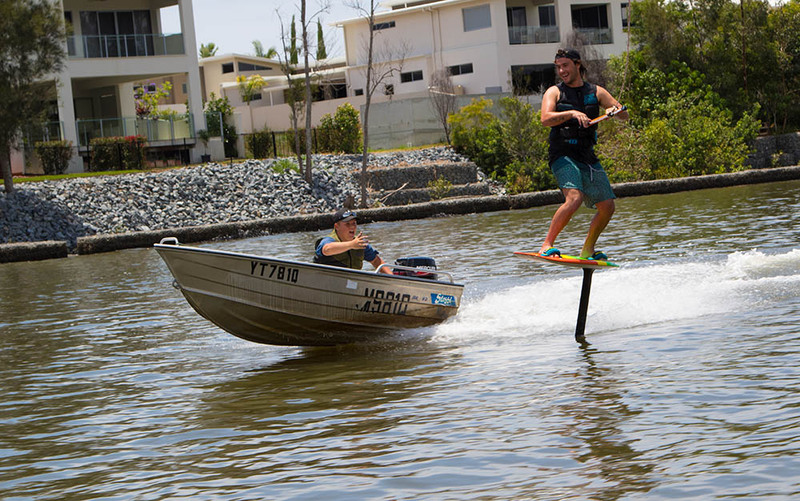 “I want to foil…that just looks insane,” I said to the crew at SurfFx on the Gold Coast. Only eight months into my kiting career and still in the gusty winter months, they suggested I wait until summer. The months that followed were the most frustrating, painful and ego destroying of my life. 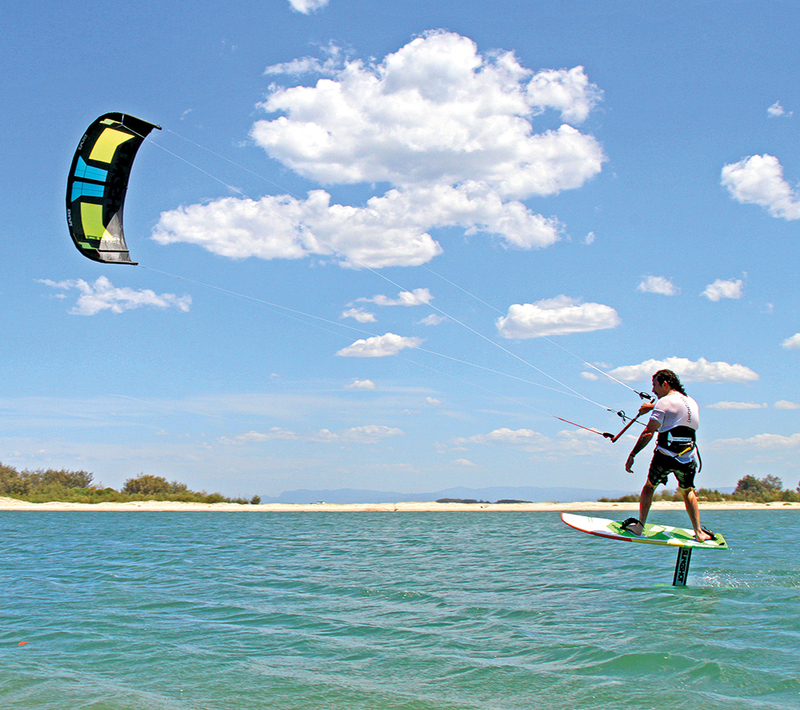 The kiting community on the Gold Coast is really friendly and everyone was always very willing to help me and give advice. But this can be a double-edged sword, with conflicting advice on mast position and length, strapless, single strap and dual straps, big boards, little boards and aspect ratios. That first month of summer, I made little progress. Struggling with a tangled kite, I made sure to always keep a box of Bandaids in my car. When I bumped into Josh van Brederode from Slingshot, he suggested that I enrol in their free online kite foiling course. The 10-lesson series explains how foiling works, and gives tips to improve your riding. The lessons include preflight skills, equipment, assembly, early learning tools, safety procedures, as well as tacking, jibing and jumping tips. Visiting the website, I demoed the foiling flight school mast set ups on the Simulator 5’6”. Boom! The lights started to come on and like that, no more Bandaids were required. 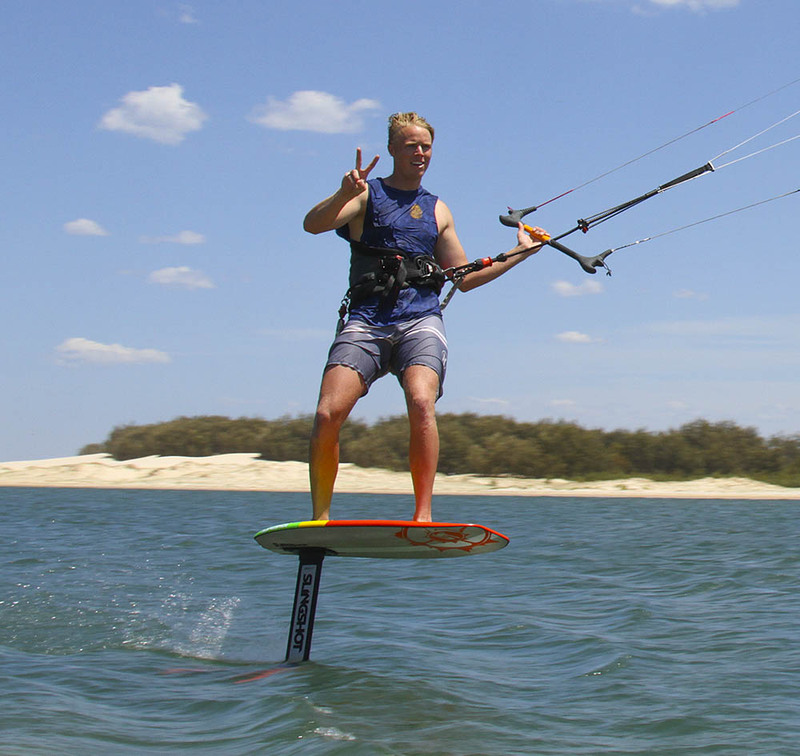 In lesson two of the Kite Foil Academy, they talk about kite ability. My kite skills were definitely still lacking. It’s a whole new world when you are trying to set your feet on the board and keep the kite at 12 o’clock. Add to that current and chop pulling you around against the foil then crashing and inverting your kite. It soon became a swearing fest. You really need to have one hand on the bar and not look at the kite. It’s all about the feeling of the kite. All the vision in the Kite Foil Academy shows this pristine foiling environment. Picking the right location to learn foiling is vital and if it’s not right, don’t try it. I started with the Taxi, the shortest mast. The Taxi is easier to push around as well as set my feet. The Taxi let me kite in shallower, friendly water. Another great piece of advice I got was to take my back foot out of the rear strap and place it in front of the strap. This allowed me to start and keep the board down to avoid the rodeo start. The more you ride the more your balance will reset. As Slingshot explains, it just takes time for muscle memory to reprogram your brain. When you are on the longer mast you really need to be aware of the foil. It’s really easy to kick your foot trying to set the board. Kite size is important. As a learner you need a larger kite so it will stay up and help with your bog starts. That soon changes as being overpowered when you are foiling is quite difficult. Be really careful, as going downwind on a foil is near impossible for a beginner. The Taxi was the big lights on moment for me. I could start foiling without the struggle. It’s much easier to keep the foil down. 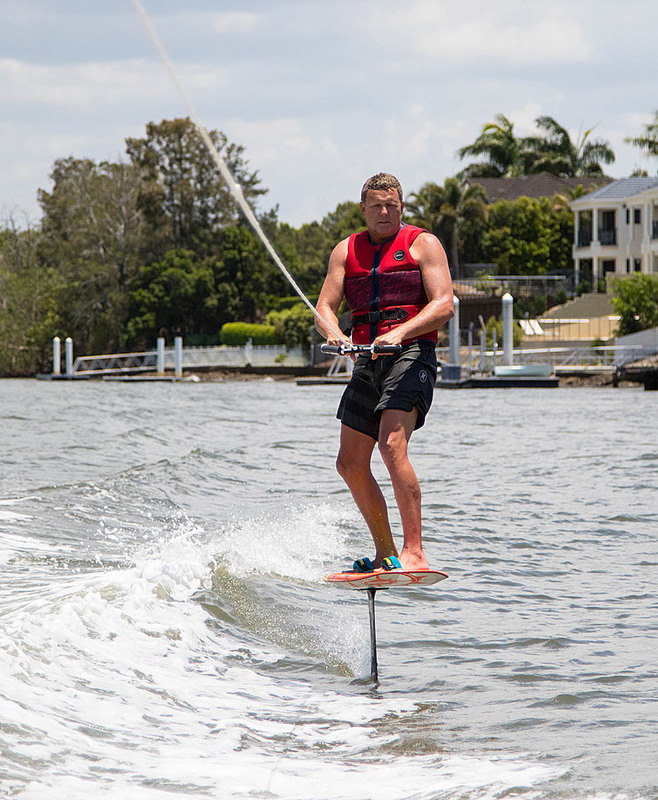 When you do foil too high the touch down to the water is very easy to recover from. The beauty of Slingshot’s multi length mast is when you are ready to progress to the next level, just ride in and swap it. Three months on, I am not a full on foiler, but I am now out there with my mates in most conditions. Everything now makes much more sense with the Kite Foil Academy. I’m now working on my jibe turns and switching my feet. After every session I come home, grab a drink in front of the computer and take in the next lesson. If you are interested in foiling, join up online. Kick back and enjoy the show. It’s by far the best foiling advice online.